Wow. When I started my “hiatus” I didn’t realize it would be this long, but as with life, one thing leads to another and before you know it nearly a month has flown by without any updates. On top of all the crazy business that is my life, my laptop decided last week would be the time to die. I have a call in to technology to see if there is any hope for it, but for now it is out of commission. So, I have been working on our antique (by technology standards) desktop. It is slow, loses connection to the internet from time to time and is quite a bear to publish from, but it still works and will have to do until I figure out the laptop situation. With spring over and summer produce coming out to play, I have been doing a lot of canning lately. Last month’s Can Jam was asparagus or rhubarb. My official post was asparagus, but I was inspired to can up some rhubarb as well. 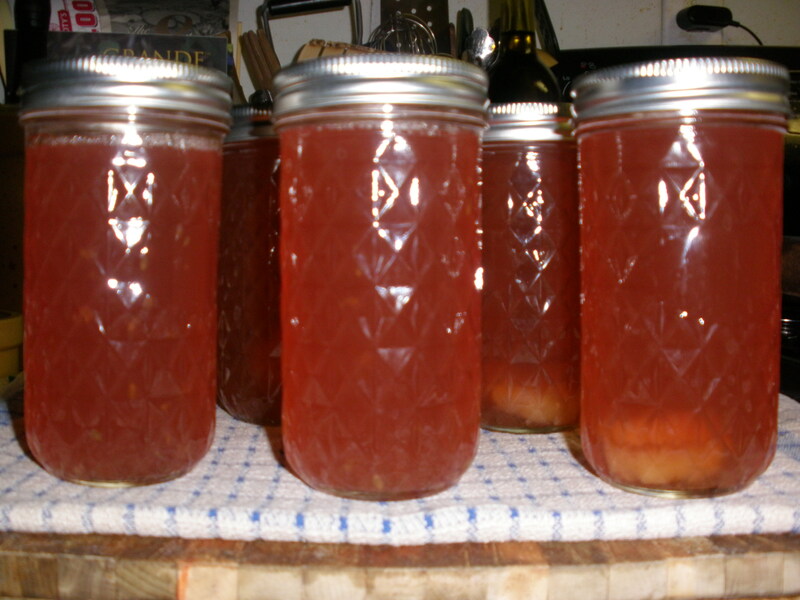 Tigress canned up a delicious rhubarb cordial she dubbed “rhubeena“. 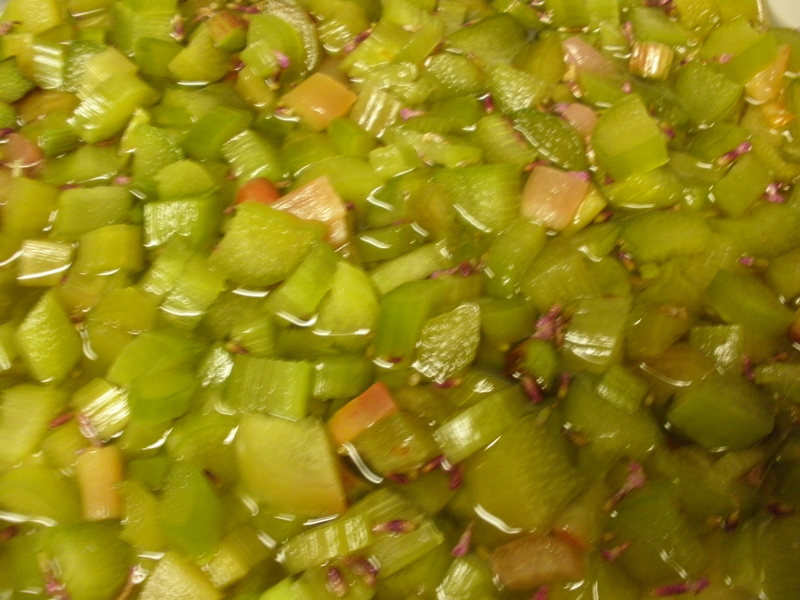 Several other participants made cordials with rhubarb as a base too. So, I looked at all the variations on cordials like this one and this one. And don’t forget about this one and especially this one. I also looked at some of the jam pairings. I haven’t made rhubarb jam before, but rhubarb lavender and rhubarb ginger both sounded delicious. Armed with all that knowledge and a slew of recipes, I decided to make a batch of lavender rhubeena. Rhubeena from the first batch~ mystery recipe. Looking back and forth between all the recipes and the different processes each canner used I started jumbling it all up and didn’t take good notes, so I can’t tell you what I actually did to create my first ‘beena but I can tell you that it was delicious. The lavender flavor was very subtle. Dylan calls it rhub-ade and it is good with soda water but with the addition of vodka it is a delicious, refreshing summer cocktail. Inspired by my success the first time (and the ten pounds of rhubarb gifted to me by my friends,) I decided to give it another go. Lavender was tasty so I decided to try that again but wanted to try something new. I also wanted to make sure to take better notes so that I could share the results with you so here we go! Even after using 17 cups of this I ended up with 3.5 pounds for the freezer to use later! And chopped into 1/2" chunks. 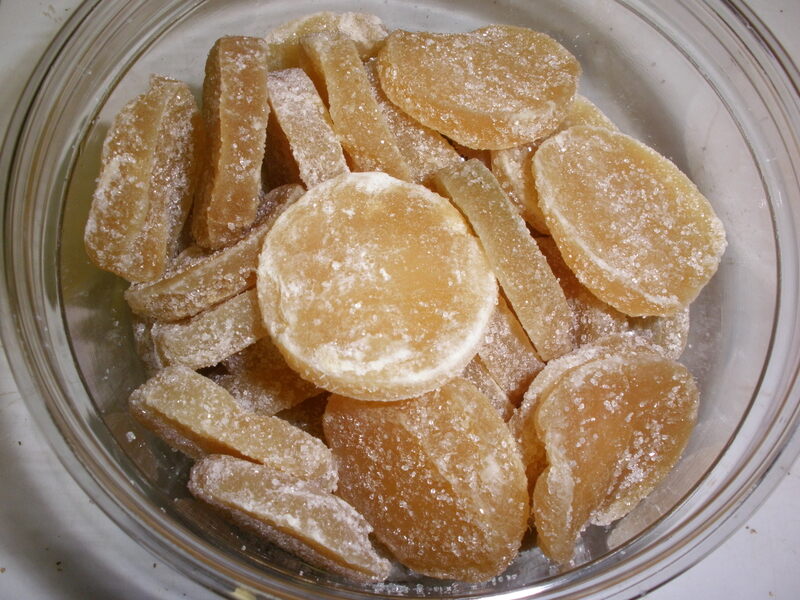 Bulk candied ginger medallions from Oryana. 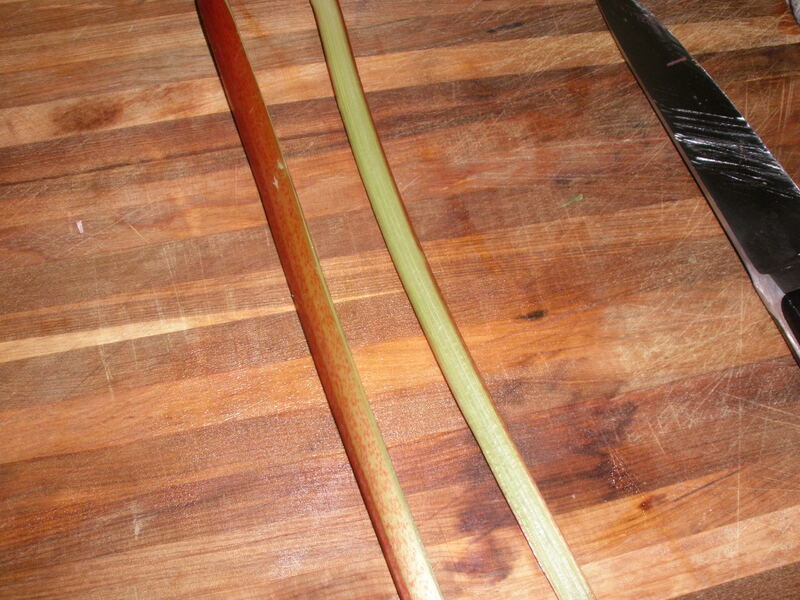 Add rhubarb and water to a large stock pot; bring to a boil. 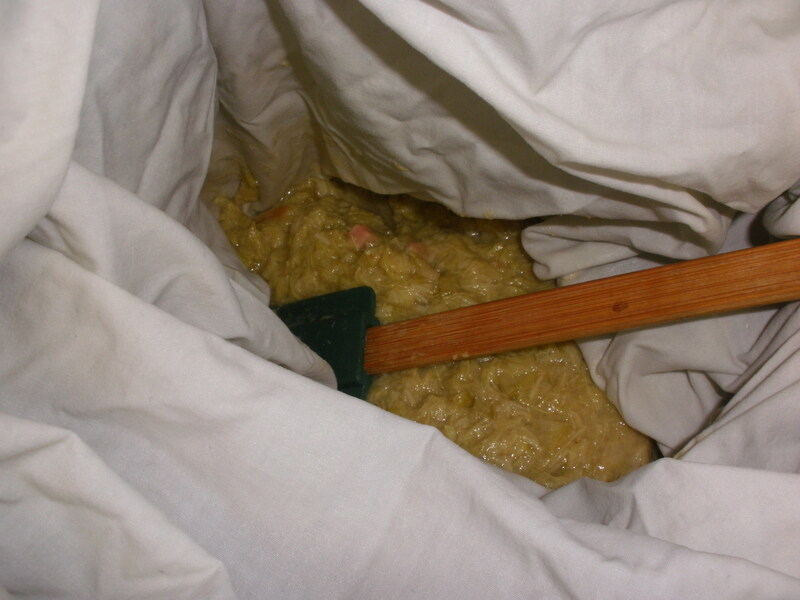 Pour rhubarb pulp into a jelly bag (or an old cotton pillowcase) and drain overnight. 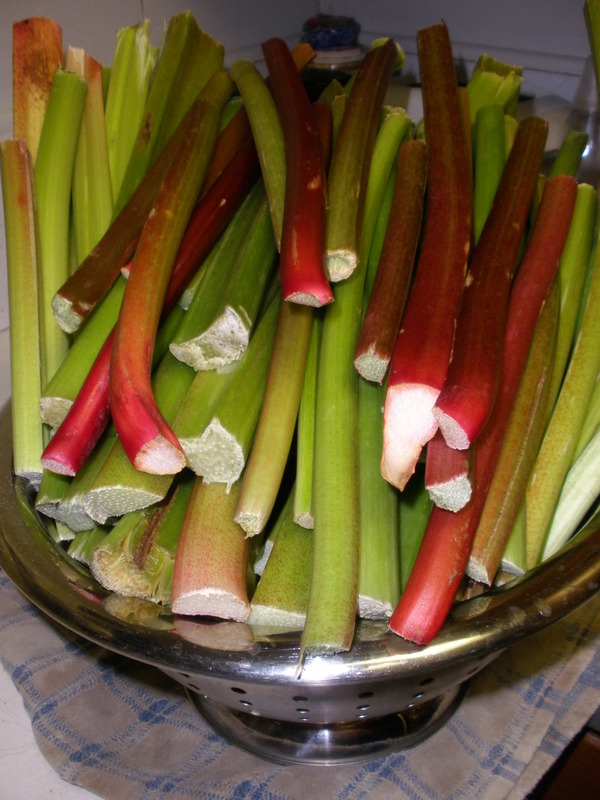 If you would like to truly disgust your children, after you are done straining the rhubarb, warm it up, add a little sugar and eat the delicious stewed rhubarb. 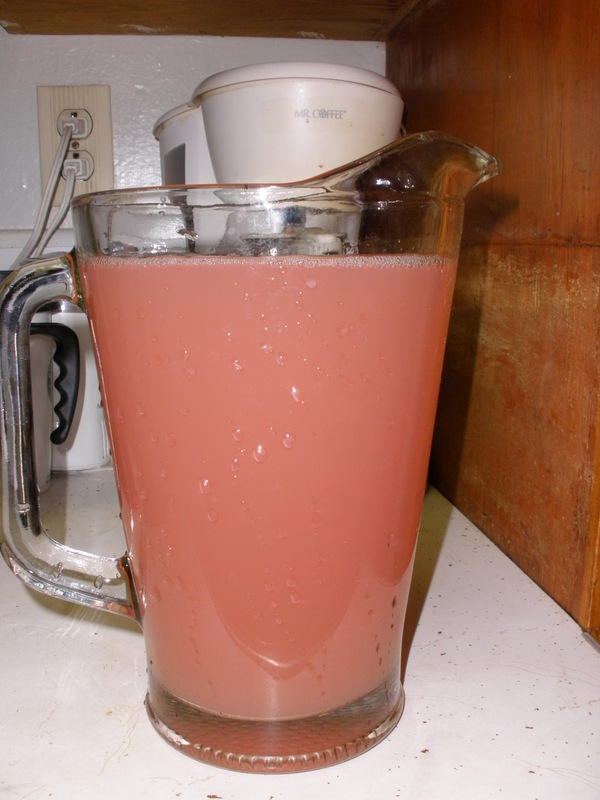 In the morning, measure the strained juice; you will need three cups of sugar per quart of juice. 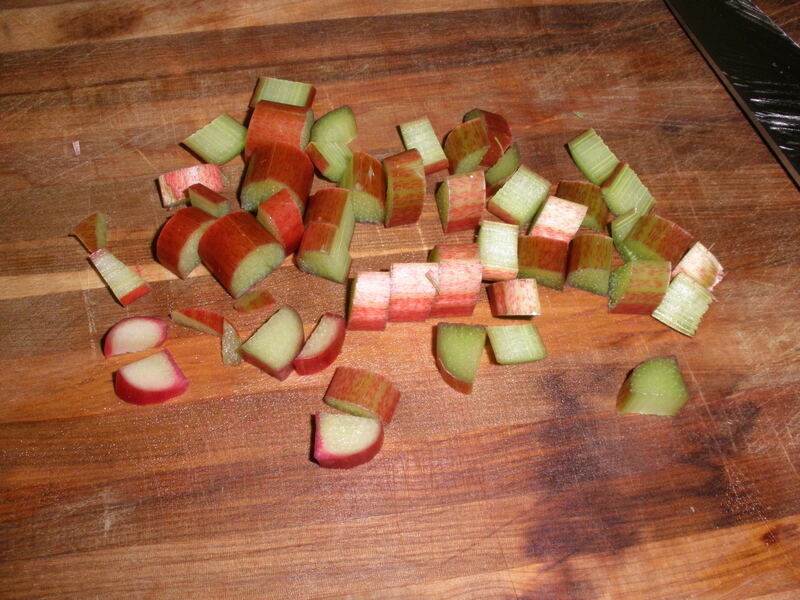 My rhubarb gave me six cups of juice so I needed 4 1/2 cups of sugar. This batch was a bit pinker than the last batch. Now for the “Two Ways” part. In a small saucepan combine 2 cups of strained rhubarb juice, 1 1/2 cups of sugar and 1 small bundle of lavender blossoms. Bring juice, sugar and lavender to a boil; turn off stove and let steep 30 minutes. 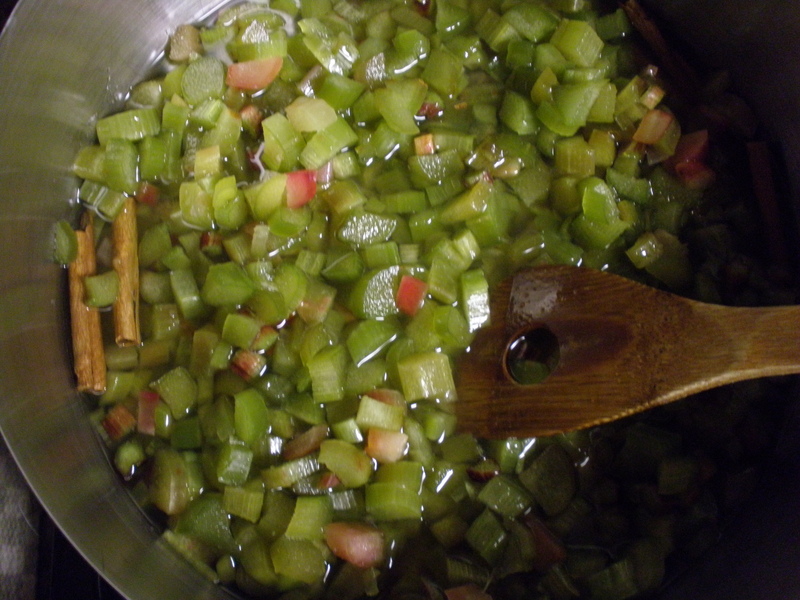 In a medium-sized saucepan combine 4 cups of strained rhubarb juice, 3 cups of sugar and 12 candied ginger medallions. Bring juice, sugar and ginger to a boil; turn off stove and let steep 20 minutes. While your ‘beenas are steeping, prepare your jars and start your water bath. I like the tall 12 oz. jelly jars for my ‘beenas because I don’t have any of these fancy Weck juice jars but use whatever you prefer. 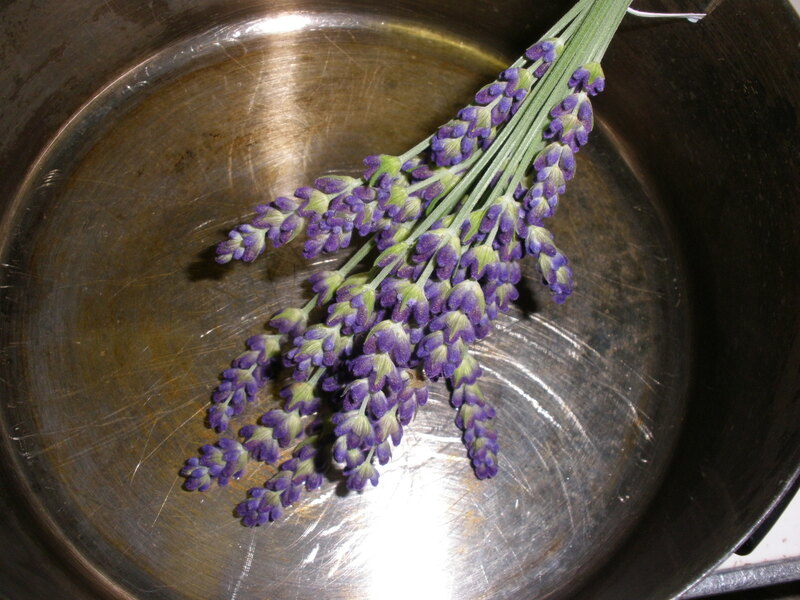 Remove lavender bundle from the lavender cordial. Some loose petals will remain in your cordial. You may strain them out but I left them in mine. Fill your hot jars with lavender cordial leaving 1/4″ head space. Place three ginger medallions in the bottom of each jar and fill your hot jars with ginger cordial leaving 1/4″ head space. Process your cordial in a boiling water bath for 10 minutes. See the ginger medallions in the left jar? I had about a cup of ginger-beena left over. I could have processed it in a smaller jar, but I wanted to try it out so I put it in the fridge. We tried it the next day and YUM! Ginger is my new favorite. It tastes like the best ginger ale syrup ever! 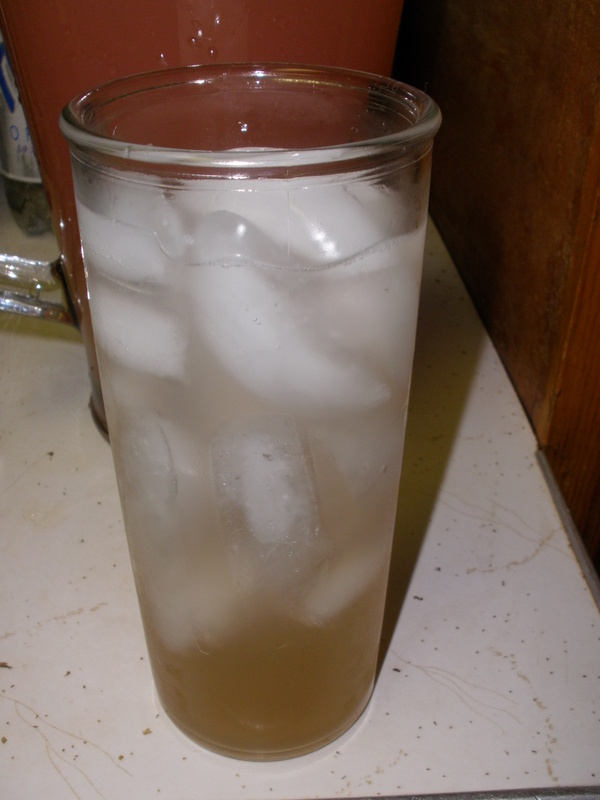 Add about 2 ounces to a tall glass and fill with soda water. This is also super delicious with a splash of vodka. 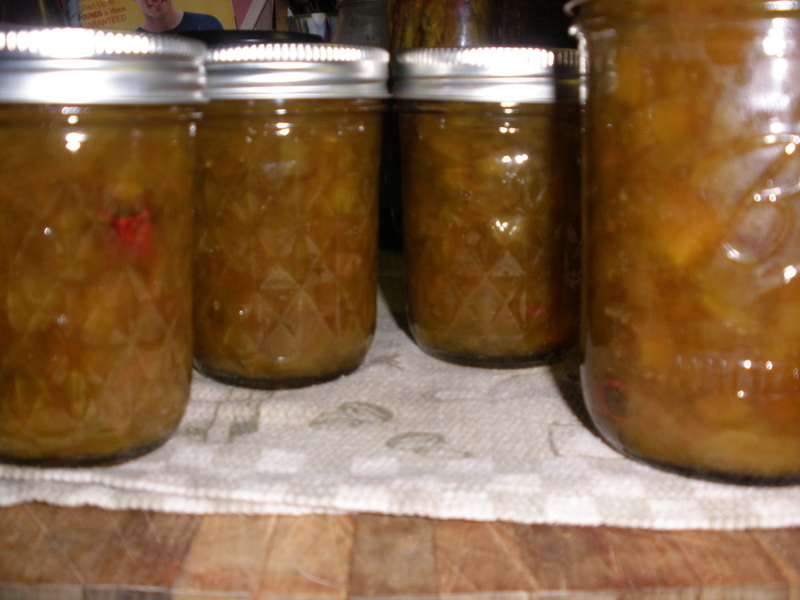 I think the flavor will intensify with age because I added the medallions to the jars. I like my ginger ale with a bite, but you could strain the medallions out if you like a milder ginger ale.